With attractive colors, mysterious affection and mellow aroma, wine contains fresh juice of life and demonstrates profound history and culture. 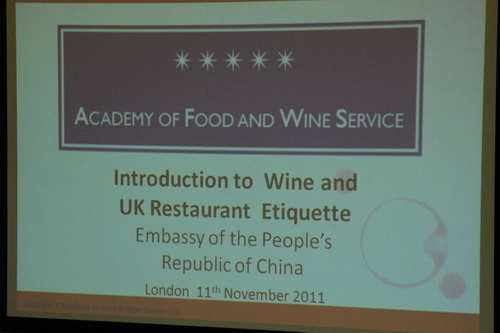 In the evening of November 11, the Chinese Embassy Women's Group invited Mr. Neil Robertson, Chief Executive of British Institute of Innkeeping (BII) and Mr. Scudder, BII's senior wine expert, to give a lecture on the identification of different wine categories, the use of different wines on different occasions, the best combination of wine and food and other related knowledge. 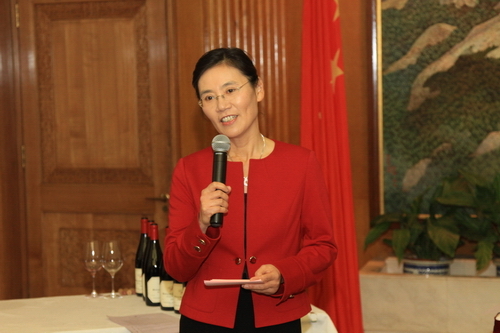 The event aimed at helping the staff of the Chinese Embassy to have better etiquette and wine tasting ability, allowing the staff members and their families to learn more about wine and wine tasting culture and facilitating the exchanges with foreign countries, Ambassador Liu Xiaoming, Madame Hu Pinghua and over 100 diplomats and their families attended the lecture. 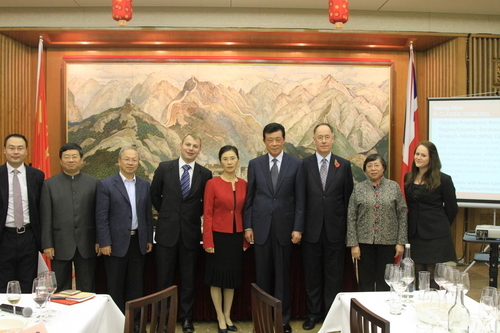 Ambassadress Madame Hu Pinghua first delivered a speech. 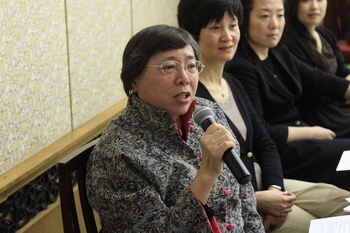 She said that the alcohol making in China can be traced back to thousands of years ago, and alcohol has been an indispensable part of everyday life of the Chinese people. Li Po, a great poet in Ancient China, had many poems on grape wine. The poems remain well-known today. It is said that much of the poet's inspiration comes from alcohol. 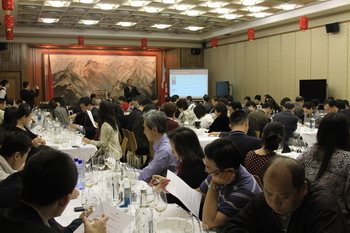 In China the alcohol drinks were mainly rice wines or grain spirit. 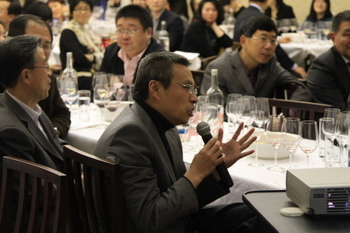 It is only in recent decades when the western wines were massively introduced to China, but they have become increasingly popular among the Chinese people. 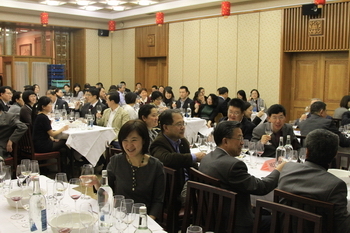 Today, it is common to drink wine in China, especially in Chinese cities, but most Chinese people need to know more about the western wine culture, such as how to taste wine, the wine's role in various social situations and how to match food with wine. I believe today's event will be a unique opportunity for the participants to get a better understanding of the western wine culture, the UK and the British people who created the British wine culture. "Tasting wine is like tasting life. The relentless pursuit in all steps, such as the planting, growth, flowering, fruiting, harvesting, fermentation and storage of grapes, brings bottles after bottles of excellent wine". 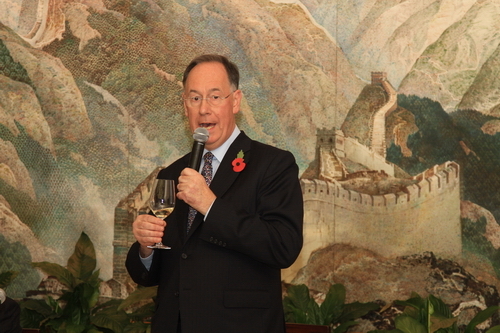 Mr. Scudder's remarks led the audience into the world of wine. He first briefly introduced the wine making process and the things to be noted in the collocation of wine and food, and then explained the specific method of wine tasting in respect of appellation, temperature, color, swirl, smell, savor, etc. For tonight's wine tasting, Mr. Robertson specially brought eight different red and white wines and champagnes. Mr. Scudder told the participants to pour the wine into the glass and gently swirl it, then put the glass close to the nose to feel the pleasant light fragrance, then close the eyes to carefully distinguish the different odors and experience the joy brought by the integration of them with each smell, and then express this wonderful feeling in words to share and enjoy the happiness given by wine. The entire event was in a relaxing and pleasant atmosphere. Mr. Scudder also patiently answered various questions, such as: how are wines priced, how to become a wine taster, how much wine per day is good. British Institute of Innkeeping (BII) is the UK's most influential industry association in the licensed retail sector. It has over 15,000 members across the UK. The Institute was founded in 1981. Its subordinate specialized certification body BIIAB (BII Awarding Body) has so far issued more than 1.5 million certificates in the licensed retail sector, with liquor licenses composing a big part.